Now there’s yoga that’s right for you, regardless of your size or circumstance. 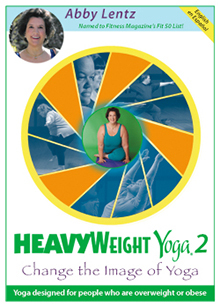 Join Abby and her students for a complete HeavyWeight Yoga class. Now there’s yoga that’s right for you, regardless of your size or circumstance. Join Abby and her students for a complete HeavyWeight Yoga class. Through their heartfelt interviews, learn how these remarkable students from diverse situations achieved better health and well-being with yoga. It’s never too late to start. Begin in this class with Abby and her students. Learn how to practice yoga alongside everyday people – using the body you have today.